Unlike organic contaminants, most metals do not undergo microbial or chemical degradation and the total concentration of these metals in soils persists for a long time after their introduction (Adriano, 2003). With greater public awareness of the implications of contaminated soils on human and animal health there has been increasing interest amongst the scientific community in the development of technologies to remediate contaminated sites. For diffuse distribution of metals (e.g. fertilizer-derived Cd input in pasture soils), remediation options generally include amelioration of soils to minimize the metal bioavailability. Bioavailability can be minimized through chemical and biological immobilisation of metals using a range of inorganic compounds, such as lime and phosphate (P) compounds (e.g. apatite rocks), and organic compounds, such as 'exceptional quality' biosolid (Figure 1; Bolan and Duraisamy, 2003). Reducing metal availability and maximizing plant growth through inactivation may also prove to be an effective method of in situ soil remediation on industrial, urban, smelting, and mining sites. The more localised metal contamination found in urban environments (e.g. Cr contamination in timber treatment plants) is remediated by metal mobilization processes that include bioremediation (including phytoremediation) and chemical washing. Removal of metals through phytoremediation techniques and the subsequent recovery of the metals (i.e. phytomining) or their safe disposal are attracting research and commercial interests. However, when it is not possible to remove the metals from the contaminated sites by phytoremediation, other viable options, such as in-situ immobilisation should be considered as an integral part of risk management. Since bioavailability is a key factor for remediation technologies in-situ (im) mobilization using inorganic and organic compounds that are low in heavy metal content may offer a promising option. In this paper, after a brief introduction of sources of metal inputs and their dynamics in soils, the role of various inorganic and organic soil amendments in the (im) mobilization of metals in soils in relation to managing their bioavailability and remediation, will be discussed. The bioavailablity of a chemical in the soil environment has been defined as the fraction of the total contaminant in the interstitial pore water (i.e., soil solution) and soil particles that is available to the receptor organism (Naidu et al., 2008). Bioavailability of metals in soils can be examined using chemical extraction and bioassay tests. Chemical extraction tests include single extraction and sequential fractionation (Ruby et al., 1996; Basta and Gradwohl, 2000). Bioassay involves plants, animals and microorganisms (Yang et al., 1991). In-situ techniques involving growing of the organisms of interest in the contaminated material and quantifying the uptake of metal into the organism or assessing the toxicological response are being used by many researchers as bioindicators of contamination. Measurements of metal bioavailability and toxicity in soils using soil microorganisms are receiving increasing attention, as microorganisms are more sensitive to heavy-metal stress than plants or soil macrofauna. The methods using microflora and protozoa have the potential to provide a measure of bioavailability of heavy metals in the short-term and even facilitate the measurement of temporal changes. In contrast responses by mesofauna (microarthropods) and macrofauna (enchytridae, invertebrates and earthworms) are cumulative effects. 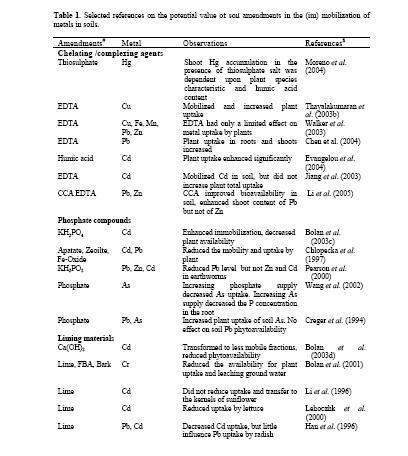 A number of amendments are used either to mobilise or immobilize heavy metals in soils (Table 1). The basic principle involved in the mobilization technique is to release the metals in to soil solution, which is subsequently removed using higher plants. In contrast, in the case of the immobilization technique the metal concerned is removed from soil solution either through adsorption, complexation and precipitation reactions, thereby rendering the metals unavailable for plant uptake and leaching to groundwater. Since one of the primary objectives of remediating contaminated sites is to reduce the bioavailability of metals, in-situ immobilization using soil amendments that are low in heavy metal content may offer a promising option. However, a major inherent problem associated with immobilisation techniques is that although the heavy metals become less bioavailable, their total concentration in soils remains unchanged. The immobilised heavy metal may become plant available with time through natural weathering process or through breakdown of high molecular weight organic-metal complexes. 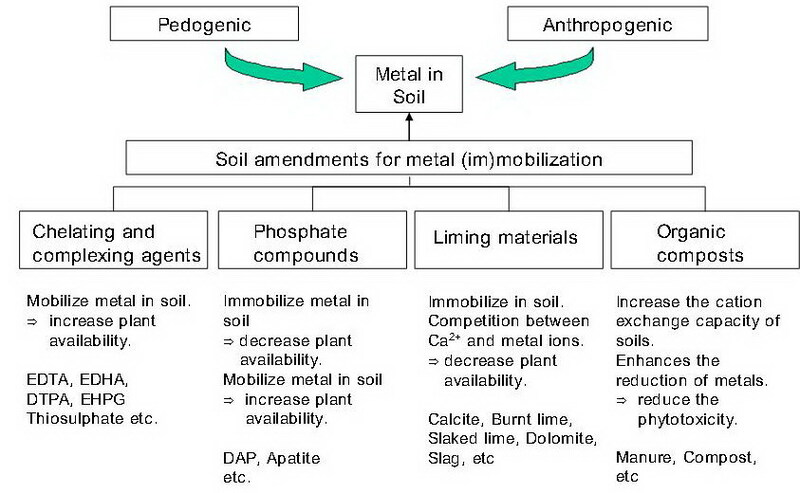 Although the formation of soluble metal-organic complexes reduces the phytoavailability of metals, the mobility of the metal may be facilitated greatly in soils receiving alkaline-stabilized biosolid because of the reduction of metal adsorption and increased concentration of soluble metal-organic complex in solution. A large number of studies have provided conclusive evidence for the potential value of both water-soluble and water-insoluble P compounds to immobilize metals in soils, thereby reducing their bioavailability for plant uptake. However, it should be recognized that, depending on the nature of P compounds and the heavy metal species, application of these materials could cause either mobilization (e.g., As) or immobilization (e.g., Pb) of the metals. While mobilization by certain P compounds enhances the bioavailability of metals, immobilization inhibits their plant uptake and reduces their transport in soils and subsequent ground water contamination. Furthermore, some of these materials contain high levels of metals (e.g., Cd) and can act as an agent of metal introduction to soils. Accordingly, these materials should be scrutinized prior to their large-scale use as immobilizing agent in contaminated sites.